Stanislaw (Stanley) Kulak, 91, of Bristol, beloved husband of Maria (Ugolik) Kulak, passed away on Monday (October 22, 2018) at Bristol Hospital. Stanislaw was born in Poland on October 4, 1927 and was a son of the late Domienik and Bronislawa (Karpej) Kulak. He was raised in Poland and came to the US in 1963. 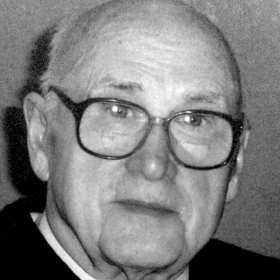 He was a parishioner of St. Stanislaus Church and worked at Gros-Ite Industries Inc. in Farmington before retiring. Stanislaw enjoyed going to Hammonasset beach and camping. He liked to build, garden and tinker in his workshops. He was a quite man with a big heart, a sense of humor and loved his family dearly. In addition to his beloved wife of 61 years, Stanislaw is survived by his son: Richard Kulak and his wife Peggy of Niantic; his two daughters: Elizabeth Beninson and her husband Terry of Westbrook, Eva Weymouth and her husband Carl of West Hartland; two brothers: Casimir Kulak of Fairfield, Ronald Kulak of New Britain; two sisters: Christina Wilga of Massachusetts , Helena Wotring of Plainville; six grandchildren: Rick, Joe, Evan, Adam, Eric, Noah; and several nieces and nephews. In addition to his parents, he is predeceased by his brother: Mietek Kulak; and his sister: Leokadia Raducha. Funeral services will be held on Friday, (October 26, 2018) at 9:00 AM from Funk Funeral Home, 35 Bellevue Ave., Bristol, to St. Stanislaus Church, 510 West Street, Bristol, for a Mass of Christian Burial at 10:00 AM. Burial will follow in St. Joseph Cemetery. Relatives and friends may call at Funk Funeral Home on Thursday from 5 PM to 7 PM. Please visit Stanislaw’s memorial web-site at www.FunkFuneralHome.com.